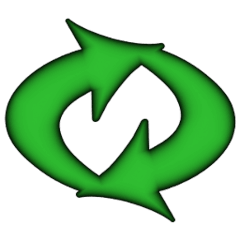 Systemback is a simple backup and restore application for Ubuntu Linux that makes it easy to create backups of system and users configuration files. In case of problems you can easily restore the previous state of the system. With systemback, you can create a Windows like system restore point by clicking on the Create new button. It will take a few minutes backing up system files and user configuration data. User files such as documents, pictures and music are excluded. During this time, you can click the Interrupt button to cancel the process. Once you created a restore point, it will be list in the main window with a name looks like “2014-7-11, 20.50.47” (see the first picture). 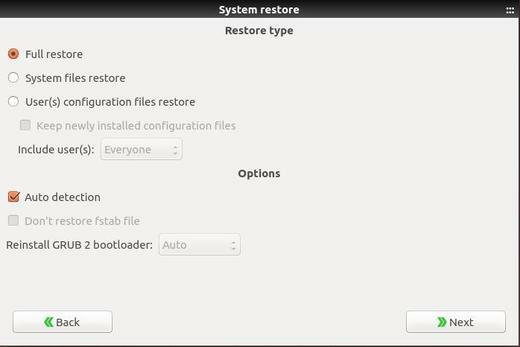 Choose it and you’re able to click the System restore button. 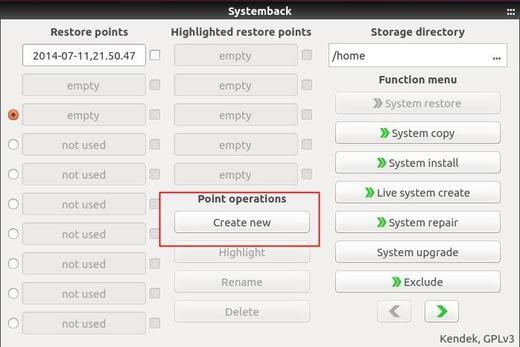 Then you can easily restore your system status to the time you create the point. Under the function menu, click the green arrow button, you’ll see a button Schedule which allows you to create restore points in a scheduled time. Create new user, set root password, change hostname. Create a Live CD/DVD/USB from current system with or without user data. System file repair, Grub2 repair. The latest stable v1.0 (qt5 port) is available in the developer’s PPA for Ubuntu 14.10 and Ubuntu 14.04. A old stable version is also available for Ubuntu 12.04. I have tested the Systemback with Mint 17 original firmware: 3.13-** and all is good. All the program works properly. The syste is stable, BUT in systemback with option ” live system create” the button CREATE NEW is not selectable!! Stating with the old kernel the button works!!! Not sure, but make sure “Restore Points” is not selected, “System restore” and “Live system create” buttons are not selectable at same time. How much storage does each of these different methods require? Is encryption or compression used? If so, which formats/hashes are used? I’m uncomfortable NOT knowing exactly what is and is not backed up – is there a clear description of what a “system restore point” includes anywhere? Incremental backups? We all know that doing daily backups is important for data protection, but also for security. If a daily backup takes over 3 min, I won’t do it. That means incremental backups are needed. Manual backups are soon forgotten too. Unfortunately, the developer does not provide a complete description on this project, but you can ask questions on the launchpad page. May I know where I can get userguide. I will use it on my Acer C720 Chromebook. at third step telling cd rom by inserting kubuntu installation CD but inserting CD again and again same massage is displaying , What to do?